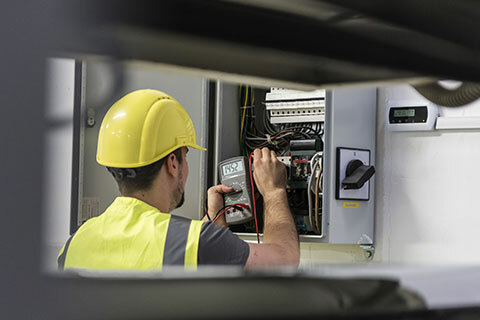 Our commercial and industrial electrical services include installation, maintenance and repair for all types of businesses, including schools, retail outlets, offices, industrial warehouses, manufacturing companies, the space industry, agriculture and more. In addition to the services listed below, many of our business customers are exploring solar energy options to cut costs. We are happy to answer any questions you may have about making the switch to solar. Peter’s six years’ experience as an aviation technician for the Australian Air Force sets him apart in the industry. As the only space industry electrical specialists in the Gawler and surrounding region we are committed to supporting this ever-growing industry and the challenges they face. We work directly with a number of farms – including customers in the poultry, pork and dairy industries – as well as providing repairs and maintenance for grain handling facilities and farm workshops. We understand that losing power can be critical to your farm, which is why we offer same-day service for power failures and can work with you to install generator backup systems so there's no down time if power is lost. In addition to the services listed below, Roo's Electrical are committed to creating unique systems and solutions for all our customers. With energy prices rising, many of our customers are exploring ways to save on their power bills. Our energy audits have helped our commercial customers become more efficient while also cutting costs. ●	Variable Speed Drives (VSD) for conveyor belts and augers, and soft-starters for motors.